Discussion in 'TV Central' started by Carrie Fairchild, Apr 11, 2018. I'm posting this here as the soaps mentioned straddle daytime, primetime, UK, US, Australia and so on. I'm just wondering what people's feelings were when certain soaps they loved, or once loved, drew to a close? And what was the "local reaction" for want of a better phrase, when it came to the show's ending? As in was there much coverage online, in newspapers, on TV etc. Were people distraught at the demise or were they past caring at that stage? I know that the US daytime soaps that ended in the 00's/10's garnered international comment because of the longevity of the shows whereas there's other shows that just petered out. There's a few shows that I watched that I watched that came to an end that I'd mixed feelings about. Brookside - I recall watching the last episode but solely because I happened to be in that night. Brookside was moved around the schedules so much that it had reached "is that still on air?" status by the time it was put out of it's misery. The pared down episodes with fewer cast and post watershed swearing made it feel unlike the show I once enjoyed so I wasn't too sad to see this one go. I know it's end got small mentions in the press but it didn't grace the cover of any magazines unlike some other shows on their way out. Sunset Beach - I wasn't prepared for this one to go. I felt it had plenty of life left in it but NBC clearly thought otherwise. Because of it's cult following on this side of the Atlantic, it's demise did garner some newspaper coverage, unheard of for US daytime soaps that are usually regarded as cheap schedule fillers. Family Affairs - this show had more overhauls than a Real Housewife's face but I still liked it. Unlike some other UK soaps, it wasn't shoved around the schedules in it's dying days and kept the same timeslot for the entirety of it's run. While it's premise wasn't particularly different from the other UK soaps, it probably had the most diverse cast at that time, so it was a shame to see it go for that reason. It garnered comment in the press because of it's status as one of Channel 5's inaugural shows but Family Affairs never really was a show to get TV mag covers during it's life so I don't recall it receiving any in it's death either. Night and Day - I loved this show but ITV tested the limits of even my dedication with it's schedule changes and pushing the show further and further into a Sunday night / Monday morning graveyard slot. It was another one that people didn't realise was still on air and it petered out in the early hours of Monday mornings with little or no mention in the press. Breakers - like Sunset Beach, I loved this show and thought it could've run and run. From what I've read, it never really got the support of Network Ten where it aired in Australia and when BBC One dropped it in the UK (relegating it to the then fledgling digital channel BBC Choice), Network Ten gave even less of a sh*t. Unlike Sunset Beach, I was unaware of the show's cancellation, only learning when the show stopped abruptly during it's airings on Irish TV. Oh my goodness. Thirty years ago last week. I do feel old. 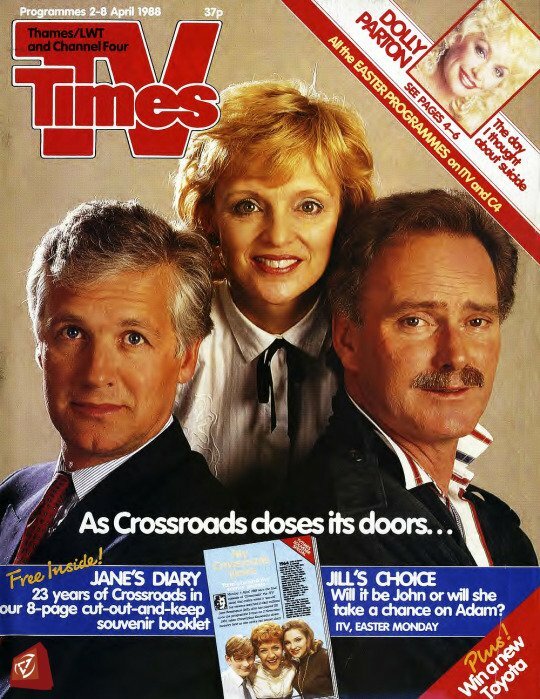 So Crossroads has now been off the air longer than it was on! This is a great topic, because I think most of us have experienced the loss of a beloved soap. The general public treats the 'mourners' like nut cases, and it's only with other fans of the show we feel we can openly express our unhappiness. It's like when some people treat you weird when you mourn the loss of a pet. Just because the show is just that--a TV show--it has also been a part of your routine, part of your life that will no longer be there. In soaps, it's easy to have that program be part of your childhood, your adolescence, and into adulthood--a lot longer than many other relationships in your life. The biggest losses in this regard (at least in my life) was when CBS cancelled Knots Landing in 1993, and especially when NBC cancelled Another World in mid-1999. Their cancellations were handled very differently. It had been agreed early on that season 14 would be the last for KL, so that final season was a chance to enjoy one last lap around the bases. Even as KL left the air, at least CBS acted as if they appreciated the viewers who had watched the show so long. NBC wanted to clear up an hour of their schedule to air their new soap/dumpster fire Passions, so they very publicly announced either AW or Sunset Beach would be cancelled to make way for it. They essentially pitted one fan base against another in a soap death match, causing internet chat rooms to erupt into flame wars, and all sorts of angry stuff flew all over. Viewers who watched both shows were vocal about not watching the "survivor" of the death match ever again (some even boycotting all of NBC), and the only thing they agreed on was that they would NEVER watch Passions. AW was older, had slightly higher ratings, and had a long history of revolutionizing the genre. SB had a younger demo and Aaron Spelling's name on it, but was the lowest-rated soap on daytime at that point. Most people assumed SB (which had only been on for a few years) would get cancelled before stalwart, old-school AW. Most people were wrong. Passions inherited AW's time slot in many markets, but NBC--still as tone deaf as ever--still cancelled Sunset Beach a short six months later, making all the flame wars pointless. Passions never earned the same ratings of AW at the time of its cancellation. The cancellation of AW was treated (later on) as the "canary in the coal mine" moment, where a well-respected, long-running soap with a decent-sized fan base was ditched by a network who wanted to own a piece of their shows. It was sort of like the first major domino to fall. Its death still causes old-school soap fans to write long-winded post-mortems in soap opera-centered forums. On a more personal level, it was quite difficult to re-program certain aspects of my life in the wake of AW's cancellation. My first VCR was purchased solely to record AW while I was in school, and I never scheduled a college class from 1-3 pm because 2pm was Another World time. Long term, I found that I was not willing to invest in other soaps with the same fervor, because it was obvious that the shows I tried to get into just were not doing it as well as AW had. I guess I'm like that guy who dates others and spends the whole time comparing them to my ex, but that's another long-winded post-mortem for some place else. I still haven't fully recovered from the cancellation of Dynasty, which is why I keep having dreams of its Big Return, but somehow they keep it hidden from me. I'm browsing the TV guide frenetically, trying to find the date, time and channel. It's there but I can't find it, maybe I've already missed it! Or maybe the TV guide is incomplete or my TV set doesn't receive that particular channel. Sunset Beach. Loved it. But it did get over-the-top crazy its last year. All Swedish soaps. None remains today. RIP. I followed most of them. I was too young when Dallas & Dynasty ended, so when I followed them, it was all re-runs. I knew when they would be ending. No shocker about that. And truth be told, I felt it was time to end them. The stories felt done and too many fan-favorite actors had left. Melrose Place. I felt it at least had another season in it, especially after the creative upswing in season 7. I was happy when Beverly Hills 90210 got cancelled - good riddance! It should've ended with season 7 and even that season was crap. Season 8, 9 and 10 were just painful. Kelly getting amnesia anyone? No? Donna's unintentionally hilarious pill addiction? By the time Knots Landing ended in many ways it was past its peak, my favourite Val was gone and there was a sense of "it's time". At least it had a good send-off with what is widely regarded as the best-ever prime time soap finale. As for "local reaction", in Australia, Knots had been banished to late night long before so except for the remaining diehards I think it went pretty much unnoticed. I remember that when Dallas went off the air in the USA it was noted in my local Swedish newspaper the next day. It included the spoiler that Joel Grey would guest star for the final episode and a photo of Larry and Linda with him. Dallas didn't end until two and a half years later in Sweden though. It was in december 1993 and I was sad to see it go. I loved James and Michelle and I had wanted the show to go on for more years since I was a fan. It was the best thing on TV IMHO. The show had been pushed back to the 10 p.m. Saturday night time slot that fall and I had gotten permission to stay up one more hour after my bedtime to watch it from my parents. When the show went off the air there was a show following it called "After Dallas" where a bunch of Swedish media personalities discussed the show and how it had changed the Swedish TV landscape and paved the way for Swedish soap operas like Varuhuset and Rederiet. I remember taping that show and watching it the next time and for me it was the first time I saw when Bobby came back in the shower and some other clips that they showed from the earlier seasons of Dallas. I was also pleased to learn that TV4 had bought the syndication rights to Dallas and would start broadcasting it from the very beginning the following year. It was only when I began watching the show from the beginning that I realized that the early years of Dallas was much better than the final four which I watched first! The next soap opera that made an impression on me was Beverly Hills 90210. I remember watching it from around 1992 up until the final season was broadcast and ended it's run approx. in february 2003. It was the one show that I followed for the longest time in the original broadcast. I followed it from week to week and I used to talk to my friends about it every monday morning since it was on Sunday evenings. However by the time Brenda was off the show I thought it wasn't the same anymore and for the last couple of years I was more or less waiting for it to be taken off the air. However by the time it finally went off the air I was sad to see it go. But I was glad that it got a good ending at least. I loved that it ended with Donna and David getting married. It was appropriate. Also when the spin-off came on TV a few years later I realized that I had really missed the show after it went off the air. I also remember when Desperate Housewives went off the air. I was a bit sad to see it go too since I had followed it from the beginning and I used to look forward to watching a new episode every week. I remember people were upset that Mike and Susan didn't get a happy ending. It seemed unnecessary to kill him off just before the show went off the air. But we were glad that Lynette and Tom got their happy ending and patched up their marriage. Also loved Gabby and Carlos. For me it will always be Dallas and I do compare it to a marriage. There were good times (1978-1985). A moment when I felt I was sleepwalking the treadmill of life and having an out of body experience (Dream Season). Then life smacked me in the face with the realitisation if dead people can come back to life, anything is possible. Now? I have this love/hate relationship with Dallas. It's not black or white - it's grey - and like life, that's a good thing. From those early building seasons until Bobby flatlined this series was near perfect. Then came the Dream Season resolution and my favourite girl Pam going out in a blaze of glory. Despite my better judgement (and like a crap relationship) I clung to hope. Hope that this series (and relationship) would revive those glory years. We should know better...it was doomed. Then...the announcement. Dallas (TNT) was returning. It was like bumping into an ex. Kind of familiar. Nostalgic feelings. But the more you linger the more you realized why you walked away from the relationship in the first place. Return to Eden was the hardest for me. The maxi series a huge hit (it’s been repeated something like 11 times in France!). The cliffhanger was amazing!! The mini series was one of the highest rated tv shows ever screened in Australia and NZ, it bet who shot JR.
Dallas though, had way past it’s used by date. This one didn’t know when to call it quits and reduced a once magnificent show into dribble. Oh dear. Dreadful last season/last episode.